It is said that the name Frangipane comes from a 16th century Italian Marquis called Muzio Frangipani. Whether this is true I do not know … I do know that this simple frangipane recipe works. I like to call it the Italian version of our Dutch almond paste (amandelspijs) mainly used in Christmas stollen and speculaas. I made these tarts the first time to practice for Christmas when I wanted to bake a nice bakewell tart with marzipan in which frangipane is also used. I found that for me tart fruits like raspberries work best with frangipane. 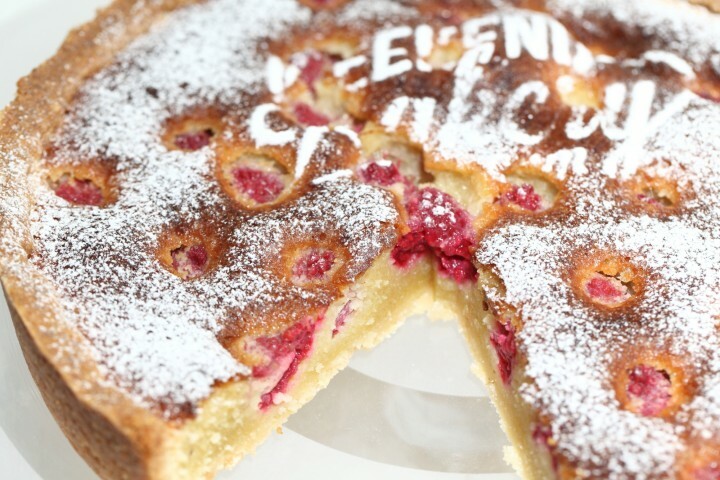 Raspberries have a nice sharpness that combines perfect with the sweetness of the frangipane. Pears are sweet and when combined with more sweet it is just a little less interesting to the pallet. If you like sweet, don’t let this stop you of course. I think apricots would also work very well, maybe cherries and certain plums or apples and of course cranberries. 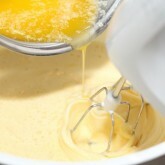 Note: To keep this recipe easy and simple I bake the tart, base and filling, in one go. The bottom does not go soggy this way when I bake it, but it is not exactly crisp either. This is absolutely no problem, the tart is perfectly delicious. But…if you are looking for a perfectly baked, crisp bottom I would suggest blind baking the pastry for 10 minutes before filling it. 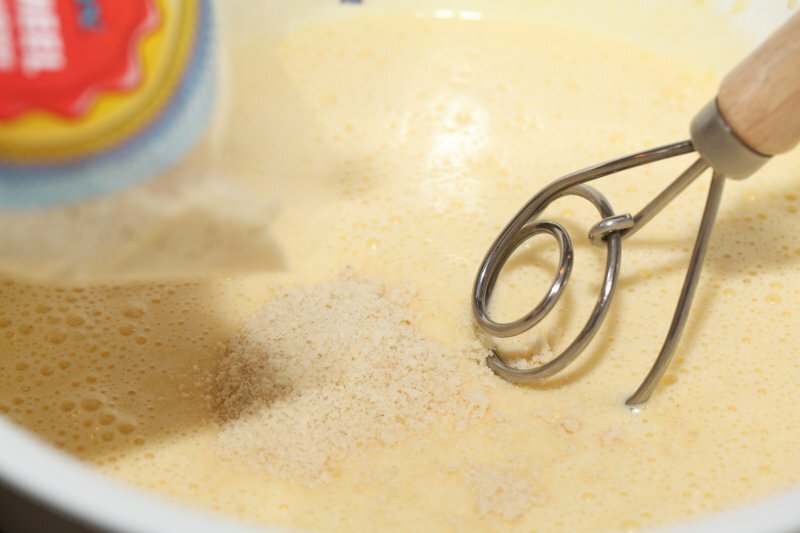 Make a firm dough with the flour, butter, sugar, salt and the half egg. Rap in clingfilm and leave to rest in the fridge for 30 minutes. Make sure the dough is cool but still easy to work with by the time you want to roll it out. Now make the frangipane by slowly melting the 125 g butter over low heat and letting it cool slightly. 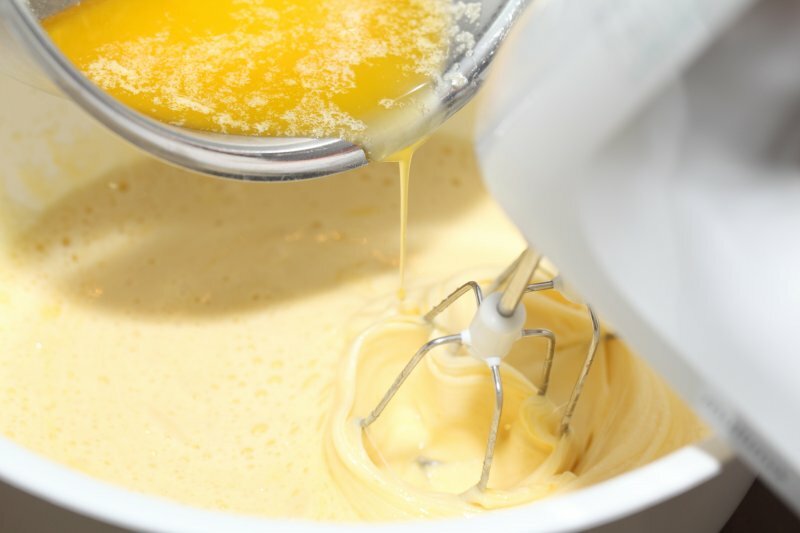 Beat the sugar together with the three eggs and the grated zest of lemon, orange or tangerine until creamy and add the melted butter while continuing to beat. 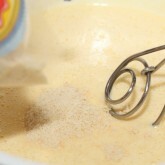 Add the almond flour and mix well. Preheat your oven to 175ºC / 345ºF. 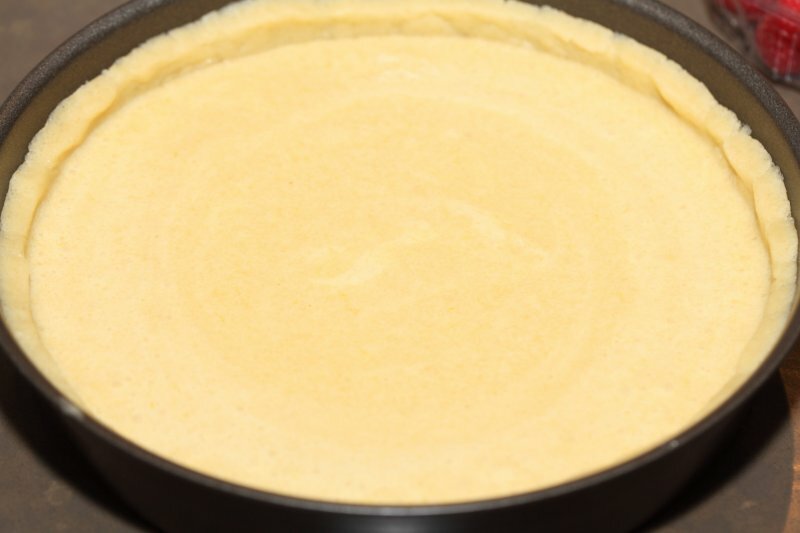 Fill a greased mold (approx 24 cm/ 9.5 inches diameter and a height of about 3.5 cm /1.4 inches preferably with removable bottom) with the rolled out pastry dough. Now spread the frangipane evenly into the mold (it very probably will spread out nice and even on it’s own). Now add your fruit. You can lay the raspberries (in a pattern) on top of the frangipane, they will sink in a little bit anyway, so no need to push them, you still want to see them. Slide the tart into the oven and bake for about 45 minutes, depending on your oven. When it’s beautiful and golden brown, puffed and firm to the touch, it is ready. Leave to cool on a rack. You can dust the tart with icing sugar before serving. You can also make individual tartelettes, like I did with the poached pears version. For this I used three pears and poached them in water with a cup of vanilla sugar, juice of a lemon and a cinnamon stick in a saucepan and left them to simmer until tender (10 to 15 minutes). I sliced them after I left them to cool in the liquid. Make sure to drain the pears on a paper towel before using them because you do not want too much liquid in your frangipane for fear of sogginess. Three pears is too much for six tartelettes, but they keep well in their liquid in the fridge for several days and you can also use them in muffins or cupcakes or eat them with some whipped cream. I made the Easy Frangipane tart. It was magnificent! Thank you so much! Wonderful to read your comment Caroline, so glad the recipe was a success for you. I’m delighted to see your recommendation of cranberries. A local bakery has that flavor for their frangipane at the moment. It’s delicious. We also live near northern Wisconsin, a major cranberry producer. I can’t wait to try it myself! Enjoy your Holiday baking and sharing! Extremely successful tartelettes made with this frangipane and a small dollop of raspberry or mandarin jam underneath! Ohhh, I like the sounds of that combination, heavenly and inspiring Deb! I’m a bit confused, as the ground almonds aren’t mentioned in the method. Is it 125 grams of almond flour OR almonds? If not, what is the quantity of each please. Not able to get almond flour, is plain OK. Thank you for your comment. You either take 125 grams of almond flour OR you grind 125 grams of almonds and use that. If you grind your own almonds you can (for instance) take an old coffee grinder and use that. Because almonds are very oily, it works best to use the 125 grams of sugar from the recipe and grind the almonds together with this sugar (to avoid the ground almonds forming an oily lumpy mass). So, no plain flour, either almond flour or ground almonds, otherwise it will not be frangipane. Thanks so much. Can I bake in a flan dish and serve it straight from there. Sorry, but not good at baking!! Yes you can. For this recipe the indication that you should keep in mind for the dish measurements is approx 24 cm/ 9.5 inches diameter and a height of about 3.5 cm /1.4 inches. Thanks ever so much again! Will let you know how it turns out! Wow Nadine, that sounds delicious. Have not heard of these ingredients for this recipe, but thank you so much for sharing your exotic variation! These recipes look beautiful. I will like to learn to make them! Thank you! Just start with a recipe that you really like and make it more than once is our advice. Hi please accept my apologies for my ignorance. I forgot I had posted a comment let alone you replied. I made the tarts, my wife loved them, but I thought they were a little heavy. Any tips for lightness. Sorry again. 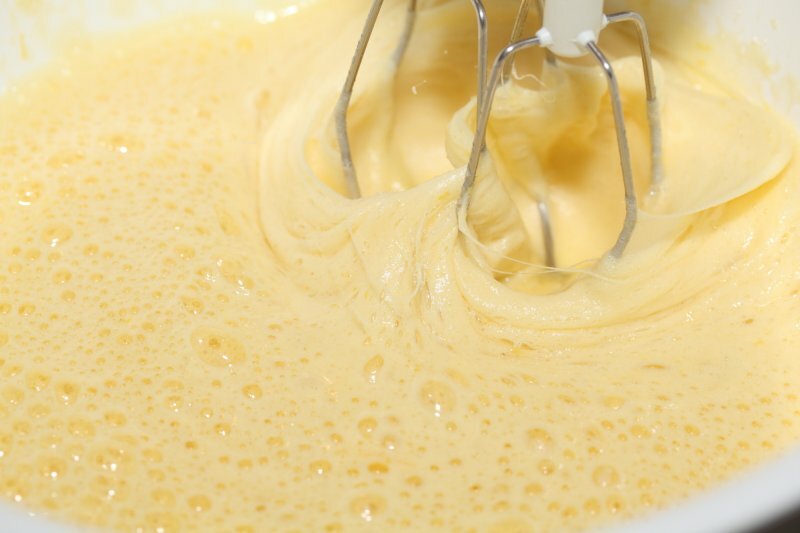 Could you beat the egg whites separately for a lighter frangipane? Would it flatten upon leaving the oven? We have never done this, but it could be worth a try. We must say we do like the rich and creamy texture of the original frangipane, but experimenting is always fun and you might come up with something wonderful! Maybe start with a combination of eggs and egg whites. Do I serve this with whipped cream or something else or nothing? We do both, depending on the occasion and wishes of our guests. 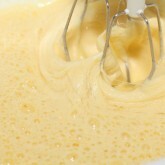 The tart does not need anything to go with it, because it is very rich, but people do love cream of course. Figured since I have made this recipe over a dozen times with various fruit/nut combinations I should let you know how gosh darn amazing I think this recipe is! Also easy to make for my coeliac friends with a little flour replacement. Love, LOVE this recipe, thank you so much! You put a smile on our faces. Wonderful to read your comment on the recipe and how much joy it brings to you and your loved ones! Turned out great even though I had to convert the measurements and I used sliced fresh peaches for the fruit. I’ll be making this again! Thank you Cathtie, sounds absolutely delicious, great the recipe worked so well for you! I would love a recipe book on frangipani ..deserts.. Thank you Crosby, much appreciated! 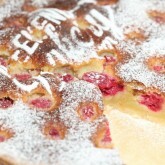 I usually make this with Cherries, can I use frozen raspberries instead. Yes you can, just take into account that frozen fruit is colder and can have an effect on baking times when used frozen plus they can contain some extra moisture. Can I substitute pecan mill to almond to make a frangipane? I prefer the pecan or walnut to almond when baking…. That sounds like an excellent idea! Although we have not yet made frangipane with pecan, it is done more often and we are certain it will work and give a very tasty result. We indeed freeze the left overs sometimes, but as often fresh is better! OK. Thanks. Will make fresh! Thank you for this addition Krissie, excellent! Glad the recipe worked out so well. 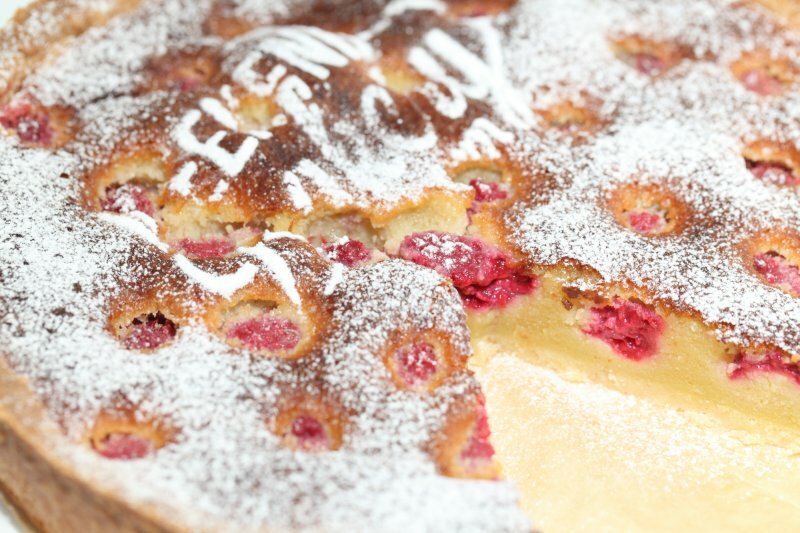 Ik heb gisteravond jullie easy frangipane en raspberry tart gemaakt, en hij is heerlijk, maar na 20 minuten extra bakken op 350 F (ik woon in de VS) niet gaar en nog steeds nat vanboven. Heb ik iets verkeerd gedaan, of hebben jullie nog suggesties? Houd de frangipane iets droger door iets minder ei toe te voegen. Zet je oven iets hoger (je oven kan bv naar beneden afwijken in werkelijke temperatuur, dat is alleen te meten met een oven-thermometer) en kijk ook even naar de plek in de oven. Zet de taart eventueel een treetje hoger, dichter bij de warmtebron. I made this tonight. My filling came out with a bit of an eggy taste. I believe this filling is more of a crème d’amande than frangipane & probably should have weighed the eggs to 125g – equal quantities to the other ingredients. Other than that it came out great. I did forget to add the egg to the pastry & added more butter to rectify the dryness (hadn’t realised I left out the egg till it was blind baking- oops) it came out beautifully short. Yum!! Oops I mean to say I should have followed the basics of the crème d’amande and made sure to use equal quantities of everything. I’m wondering if it was overly eggy due to the size of my eggs. I know it definitely was not over cooked. I think you could be right, it is a challenge with eggs because each country has their own system and a medium egg can be a large one depending on where you live. This recipe is from quite a while ago and more recently we always make it a point to be as exact as possible. The eggs I use will have a total weight of around 150 g, but I think your 125 g will work too of course. Glad the tart still turned out well enough to be enjoyed! Great one for the family too 🙂 Love to hear about this. Thank you for sharing and happy baking Kristy! I have made this twice now and it’s amazing! The first time I did not blind bake the pastry and it still turned out lovely, although I do prefer it a little more crispy. Haven’t seen the pic, but those apricots sound like a splendid idea, the combination with the frangipane is perfect of course. I sometimes make something called a ‘croûte d’abricot’ , it is the French version you could say of this recipe. I add some lavender honey and a few lavender flowers, if I want to make it truly special.